This article is about the current parliament of Germany. For the governing body of the German Confederation from 1815 to 1866, see Bundesversammlung (German Confederation). For other historical parliaments of Germany, see Reichstag (disambiguation). The Bundestag (German pronunciation: [ˈbʊndəstaːk], "Federal Diet") is a constitutional and legislative body at the federal level in Germany. For its similar function, it is often described as a lower house of parliament along the lines of the US House of Representatives and the Canadian or the British House of Commons. The German constitution, however, does not define the Bundestag and the Bundesrat as the lower and upper houses of a bicameral legislature. The Bundestag was established by chapter III of the Basic Law for the Federal Republic of Germany (Constitution) in 1949 as one of the legislative bodies of Germany and thus the historical successor to the earlier Reichstag. Since 1999 it meets in the Reichstag Building in Berlin. Norbert Lammert is the current President of the Bundestag. Members (Mitglieder des Bundestages) of the Bundestag are usually elected every four years by all adult German citizens in a mixed system of constituency voting and list voting. There are currently 631 seats, however one, belonging to the CDU, remains vacant. However, the election day can be earlier if the Federal Chancellor (Bundeskanzler) loses a vote of no confidence and asks the Federal President (Bundespräsident) to dissolve the Bundestag in order to hold new general elections. In the 19th century the name Bundestag was the unofficial designation for the assembly of the sovereigns and mayors of the Monarchies and Free Cities which formed the German Confederation (1815–1866). Its seat was in the Free City of Frankfurt on the Main. With the dissolution of the German Confederation in 1866 and the founding of the German Empire (Deutsches Reich) in 1871, the Reichstag was established as the German parliament in Berlin, which was the capital of the then Kingdom of Prussia (the largest and most influential state in both the Confederation and the empire). Two decades later, the current parliament building was erected. The Reichstag delegates were elected by direct and equal male suffrage (and not the three-class electoral system prevailing in Prussia until 1918). The Reichstag did not participate in the appointment of the Chancellor until the parliamentary reforms of October 1918. After the Revolution of November 1918 and the establishment of the Weimar Constitution, women were given the right to vote for (and serve in) the Reichstag, and the parliament could use the no-confidence vote to force the chancellor or any cabinet member to resign. In March 1933, one month after the Reichstag fire, the then president, Paul von Hindenburg, a retired war hero, gave Adolf Hitler ultimate power through the Decree for the Protection of People and State and the Enabling Act of 1933, although Hitler remained at the post of Federal Government Chancellor (though he called himself the Führer). After this the Reichstag met only rarely, usually at the Krolloper (Kroll Opera House) following the Reichstag fire starting in 1933 to unanimously rubber-stamp the decisions of the government. It last convened on 26 April 1942. With the new constitution of 1949, the Bundestag was established as the new (West) German parliament. Because West Berlin was not officially under the jurisdiction of the Constitution and because of the Cold War, the Bundestag met in Bonn in several different buildings, including (provisionally) a former water works facility. In addition, owing to the city's legal status, citizens of West Berlin were unable to vote in elections to the Bundestag, and were instead represented by 20 non-voting delegates, indirectly elected by the city's House of Representatives. The Bundeshaus in Bonn is the former Parliament Building of Germany. 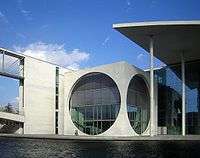 The sessions of the German Bundestag were held there from 1949 until its move to Berlin in 1999. Today it houses the International Congress Centre Bundeshaus Bonn and in the north areas the branch office of the Bundesrat ("Federal Council", the Upper House of the German Federal Parliament representing the Länder, i.e. the federated States). The southern areas became part of German offices for the United Nations in 2008. The German Unity Flag is a national memorial to German Reunification that was raised on 3 October 1990. It waves in front of the Reichstag building in Berlin, seat of the Bundestag. The former Reichstag building housed a history exhibition (Fragen an die deutsche Geschichte) and served occasionally as a conference center. The Reichstag building was also occasionally used as a venue for sittings of the Bundestag and its committees and the Bundesversammlung (Federal Assembly), the body which elects the German Federal President. However, the Soviets harshly protested against the use of the Reichstag building by institutions of the Federal Republic of Germany and tried to disturb the sittings by flying supersonic jets close to the building. Since 1999, the German parliament has again assembled in Berlin in its original Reichstag building, which was built in 1888 based on the plans of German architect Paul Wallot and underwent a significant renovation under the lead of British architect Sir Norman Foster. Parliamentary committees and subcommittees, public hearings and faction meetings take place in three auxiliary buildings, which surround the Reichstag building: the Jakob-Kaiser-Haus, Paul-Löbe-Haus and Marie-Elisabeth-Lüders-Haus. In 2005, a small aircraft crashed close to the German parliament. It was then decided to ban private air traffic over Central Berlin. Together with the Bundesrat, the Bundestag is the legislative branch of the German political system. Although most legislation is initiated by the executive branch, the Bundestag considers the legislative function its most important responsibility, concentrating much of its energy on assessing and amending the government's legislative program. The committees (see below) play a prominent role in this process. Plenary sessions provide a forum for members to engage in public debate on legislative issues before them, but they tend to be well attended only when significant legislation is being considered. The Bundestag members are the only federal officials directly elected by the public; the Bundestag in turn elects the Chancellor and, in addition, exercises oversight of the executive branch on issues of both substantive policy and routine administration. This check on executive power can be employed through binding legislation, public debates on government policy, investigations, and direct questioning of the chancellor or cabinet officials. For example, the Bundestag can conduct a question hour (Fragestunde), in which a government representative responds to a previously submitted written question from a member. Members can ask related questions during the question hour. The questions can concern anything from a major policy issue to a specific constituent's problem. Use of the question hour has increased markedly over the past forty years, with more than 20,000 questions being posed during the 1987-90 term. Understandably, the opposition parties are active in exercising the parliamentary right to scrutinize government actions. Constituent service does also take place in the form of the Petition Committee. In 2004, the Petition Committee received over 18,000 complaints from citizens and was able to negotiate a mutually satisfactory solution to more than half of them. In 2005, as a pilot of the potential of internet petitions, a version of e-Petitioner was produced for the Bundestag. This was a collaborative project involving The Scottish Parliament, International Teledemocracy Centre and the Bundestag ‘Online Services Department’. The system was formally launched on 1 September 2005, and in 2008 the Bundestag moved to a new system based on its evaluation. All candidates must be at least eighteen years old; there are no term limits. The election uses the MMP electoral system. In addition, the Bundestag has a minimum threshold of either 5% of the national party vote or three (directly elected) constituency representatives for a party to gain additional representation through the system of proportional representation. Thus, small minority parties cannot easily enter the Bundestag and prevent the formation of stable majority governments as they could under the Weimar constitution. Since 1961, only two new parties (Bündnis 90/Die Grünen and PDS/The Left) have entered the Bundestag. The most recent election, the German federal election, 2013, was held on 22 September 2013. Half of the Members of the Bundestag are elected directly from 299 constituencies (first-past-the-post system), the other half are elected from the parties’ Land lists in such a way as to achieve proportional representation for the total Bundestag (if possible). Accordingly, each voter has two votes in the elections to the Bundestag. The first vote, allowing voters to elect their local representatives to the Bundestag, decides which candidates are sent to Parliament from the constituencies. The second vote is cast for a party list; it determines the relative strengths of the parties represented in the Bundestag. At least 598 Members of the Bundestag are elected in this way. Parties that gain more than 5% of the second votes or win at least 3 direct mandates are allocated seats in the Bundestag in proportion to the number of votes it has received (d'Hondt method until 1987, largest remainder method until the 2005 election, now Sainte-Laguë method). In addition to this, there are certain circumstances in which some candidates win what are known as overhang seats when the seats are being distributed. If a party has gained more direct mandates in a Land than it is entitled to according to the results of the second vote, it does not forfeit these mandates because all directly elected candidates are guaranteed a seat in the Bundestag. 1 2 The Christian Democratic Union and the Christian Social Union of Bavaria call themselves sister parties. They do not compete against each other in the same geographical regions and they form one group within the Bundestag. 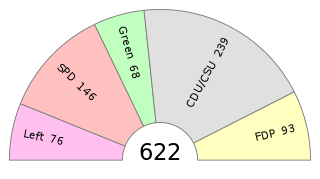 Initial distribution of seats in the 17th Bundestag. See the List of Bundestag Members for lists of changes and current members. The most important organisational structures within the Bundestag are parliamentary groups (Fraktionen; sing. Fraktion), which are formed by political parties represented in the chamber which incorporate more than 5% of the Bundestag legislators; CDU and CSU have always formed a single united Fraktion. The size of a party's Fraktion determines the extent of its representation on legislative committees, the time slots allotted for speaking, the number of committee chairs it can hold, and its representation in executive bodies of the Bundestag. The Fraktionen, not the members, receive the bulk of government funding for legislative and administrative activities. The leadership of each Fraktion consists of a parliamentary party leader, several deputy leaders, and an executive committee. The leadership's major responsibilities are to represent the Fraktion, enforce party discipline, and orchestrate the party's parliamentary activities. The members of each Fraktion are distributed among working groups focused on specific policy-related topics such as social policy, economics, and foreign policy. The Fraktion meets every Tuesday afternoon in the weeks in which the Bundestag is in session to consider legislation before the Bundestag and formulate the party's position on it. Parties which do not fulfill the criterion for being a Fraktion but have at least three seats by direct elections (i.e. which have at least three MPs representing a certain electoral district) in the Bundestag can be granted the status of a group of the Bundestag. This applied to the Party of Democratic Socialism (PDS) from 1990-1998. This status entails some privileges which are in general less than those of a Fraktion. In the current Bundestag, there are no such groups (the PDS had only two MPs in parliament until 2005 and could thus not even considered a group anymore; the party has now returned to the Bundestag with full Fraktion status). The Bundestag's executive bodies include the Council of Elders and the Presidium. The council consists of the Bundestag leadership, together with the most senior representatives of each fraktion, with the number of these representatives tied to the strength of the Parliamentary groups in the chamber. The council is the coordination hub, determining the daily legislative agenda and assigning committee chairpersons based on Parliamentary group representation. The council also serves as an important forum for interparty negotiations on specific legislation and procedural issues. The Presidium is responsible for the routine administration of the Bundestag, including its clerical and research activities. It consists of the chamber's president (usually elected from the largest fraktion) and vice presidents (one from each fraktion). 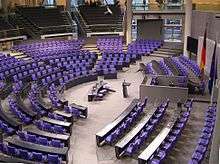 Most of the legislative work in the Bundestag is the product of standing committees, which exist largely unchanged throughout one legislative period. The number of committees approximates the number of federal ministries, and the titles of each are roughly similar (e.g., defense, agriculture, and labor). There are, as of the current eighteenth Bundestag, 23 standing committees. The distribution of committee chairs and the membership of each committee reflect the relative strength of the various Parliamentary groups in the chamber. In the current eighteenth Bundestag, the CDU/CSU chaired twelve committees, the SPD seven, the The Left (Die Linke) two, and the environmentalist party, the Greens (Bündnis 90/Die Grünen), two. Members of the opposition party can chair a significant number of standing committees (e.g. The budget committee is always chaired by the biggest opposition party). These committees have either a small staff or no staff at all. As is the case with some other parliaments, the Bundestag is subject to the principle of discontinuation, meaning that a newly elect Bundestag is legally regarded to be a body and entity completely different from the previous Bundestag. This leads to the result, that any motion, application or action submitted to the previous Bundestag, e.g. a bill referred to the Bundestag by the Federal Government, is regarded as void by non-decision (German terminology: "Die Sache fällt der Diskontinuität anheim"). Thus any bill that has not been decided upon by the beginning of the new electoral period must be brought up by the government again, if it aims to uphold the motion, this procedure in effect delaying the passage of the bill. Furthermore, any newly elected Bundestag will have to freshly decide on the rules of procedure (Geschäftsordnung), which is done by a formal decision of taking over such rules from the preceding Bundestag by reference. Any Bundestag is considered dissolved only once a newly elected Bundestag has actually gathered in order to constitute itself (Article 39 sec. 1 sentence 2 of the Basic Law), which has to happen within 30 days of its election (Article 39 sec. 2 of the Basic Law). Thus, it may happen (and has happened) that the old Bundestag gathers and makes decisions even after the election of a new Bundestag that has not gathered in order to constitute itself. For example, elections to the 16th Bundestag took place on 18 September 2005, but the 15th Bundestag still convened after election day to make some decisions on German military engagement abroad, and was entitled to do so, as the newly elected 16th Bundestag did not convene for the first time until 18 October 2005. ↑ Grundgesetz für die Bundesrepublik Deutschland (PDF) (23.12.2014 ed.). Bonn: Parlamentarischer Rat. 8 May 1949. Retrieved 19 June 2016. ↑ "Katherina Reiche (Potsdam), CDU/CSU". Bundestag.de. Retrieved 19 June 2016. ↑ Trenel, M. (2007). "Öffentliche Petitionen beim deutschen Bundestag - erste Ergebnisse der Evaluation des Modellversuchs = An Evaluation Study of Public Petitions at the German Parliament" (PDF). TAB Brief Nr 32. Deutscher Bundestag. Retrieved 16 June 2009. ↑ "Text des Bundeswahlgesetz (BWahlG)". gesetz-im-internet.de. Retrieved 19 June 2016. ↑ Hawley, Charles (15 January 2009). "Political Landscape in Flux ahead of 2009 Votes". Der Spiegel. Retrieved 20 June 2009. ↑ "Final result of the Election to the German Bundestag 2013". The Federal Returning Officer. Retrieved 23 September 2013. ↑ "Press Release: Verkürzte Fristen zur vorgezogenen Neuwahl des Deutschen Bundestages". www.bundeswahlleiter.de. Bundeswahlleiter = Federal Director for Elections (Federal Returning Officer). 25 July 2005. Archived from the original on 7 October 2007. Retrieved 20 October 2008. ↑ "Stenographischer Bericht der 187. Sitzung des 15. Deutschen Bundestages am 28. September 2005 = Stenographic report of the 187th session of the 15th Deutscher Bundestag on 2005-09-28" (PDF). dip21.bundestag.de. Deutscher Bundestag. 28 September 2005. Retrieved 20 October 2008. ↑ "Stenographischer Bericht der 1. Sitzung des 16. Deutschen Bundestages am 18. Oktober 2005 = Stenographic report of the 1st session of the 16th Deutscher Bundestag on 2005-10-18" (PDF). dip21.bundestag.de. Deutscher Bundestag. 18 October 2005. Retrieved 20 October 2008. Wikimedia Commons has media related to Bundestag.